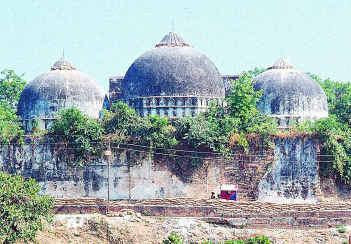 Twenty years ago (December 6, 1992) on this fateful day, Babri Mosque was demolished. This demolition remains a major blot in the history of India. It was the act of demolition by communal forces which reflected the changing polity of India and it in turn further changed the polity in a very adverse direction. Liberhan Commission showed that it was a pre-planned act orchestrated by Sangh Parivar, which gloated over it and celebrated it as Hindu Shaurya Diwas (Hindu Bravery Day). RSS combine and many an ideologues sympathizing with its ideology projected and are projecting this demolition as a major act of Nation building! While those committed to democracy and secularism see this day as a day which shamed Indian democracy; secularism and opened the floodgates of further communal polarization in a very intense way. What emerged from this tragic day was the strengthening of communal forces due to which BJP emerged as the major party at electoral level, which further communalized our culture into a narrow sectarian one. The values of divisiveness and intolerance towards weaker sections grew further. While the communal forces led the onslaught, the so called secular party, the Congress did everything to let the things go on, as a passive onlooker or an active colluder. Congress failed to protect the mosque and showed its week knees to the extent that many started equating Congress with BJP. It started being said that what BJP does openly during the day Congress does it covertly, by the night. These two major parties have ruled the Indian political space. In this BJP is programmatically communal and Congress is opportunistically communal. Not to be left behind during this demolition and in the aftermath of demolition, the violence which followed; the acts of violence which took place later and the role of police which was revealed during all these episodes has come as a shocker in a very blatant way. During demolition police failed to do its allotted duty and during violence it either looks the other way round or assists the rioters. In the aftermath of the violence, its role is again suspect. While the major victims of violence are the minorities, uniformly police arrests more from the minority community in large numbers. Despite some noble exceptions, many police personnel are most willing to violate the process of law to support the majoritarian communalism. The violence has a pattern. While the Muslims are 13.4% according to 2001 census, the number of victims from Muslim minorities is close to 90%. The strong persistence of biases against them acts as the fertile ground on which the violence takes place. Most sections of society, including political leadership of many parties, large sections of those in bureaucracy and police have strong biases against these hapless minorities, due to which the starting point of their action is in presuming that they are criminals. What follows next in the form of their action, quite conforms to this pattern. The violence has been leading to polarization of communities along religious lines. This polarization is so strong by now that starting from schools, colleges and some work places, where per chance some Muslims find employment, the segregation along religious lines is becoming discernible. This polarization has led to the rise of communal forces to bigger electoral power is very visible. In Mumbai, as Shiv Sena took the lead in violence, it did come to grab electoral power in the aftermath of violence. Simultaneously the inquiry commission reports, which have come out so far, Srikrishna or Liberahan, get their place in the cold storage. While the communal parties in power treat these reports with disdain, the Congress shows no interest in getting them implemented, the calculations of vote bank comes to the fore and we painfully see the work of judiciary, the inquiry commission reports, adorning the library shelves, and that’s about all. Had there been the rule of law, the perpetrators of hate speech, those who lead the communal violence would have been behind the bars rather than roaring in the streets and being upgraded to be called as Hindu Hriday Samrats (Emperor of Hindu Hearts). It is no coincidence that after the 92-93 Mumbai carnage Bal Thackeray, who led the violence, and Narendra Modi who was at the centre of 2002 Gujarat pogrom, both came to be anointed with this pre fix of Hindu Hriday Samrat. The impact of communalization process is also visible in section of judiciary. In states like Gujarat, the cases had to be shifted out of the state to see that the justice is done. In case of Ayodhya judgment of Allahabad High Court, we saw the situation where two of the three judges resorted to the ‘faith’ of the people to divide the ‘disputed’ land amongst three contending parties. This was something neither asked for by the litigants nor can stand on the legal grounds. The divisive violence has been leading to the formation of physical ghettoes where the sunlight of progress and liberal value can hardly reach despite the best efforts of the social workers committed to the cause of education and reform. In Mumbai in particular Mohalla Committees did play some positive role and do continue to play the same in some form, thanks to the affirmative action by some police officers of impeccable reputation and the social workers committed to the cause of peace in society. Unfortunately the response of state and the social groups to mitigate such a downward shift of the polity has not been adequate. While Government has set up National Foundation for Communal Harmony, its agenda and resources are too limited to address the mammoth task of spreading the awareness about the values of secular democratic values to most of the sections of society. The school text books, NCERT, have been improvised but these do not reach all the students, the state boards have yet to follow it. The sensitization efforts of the state, sensitization of bureaucracy and police are far from adequate. The need to look at their syllabi is most urgent. Surely they have a lot of time to spend for their basic job of policing or becoming the part of steel frame of the country but the aspects of education related to national integration have also to be taken more seriously and need to be integrated in to their curricula. The communal violence bill which can go a long way to prevent the occurrence of violence is again lying in the freezer of the government. Social groups have their own limitations. While some social groups have focused on getting justice and have praiseworthy results, still the journey is too long due to the structural problems created due to spread of communal ideology and mindsets, which are dominating the social space. The emphasis on awareness program, though are there, these remains patchy, ad hoc and are not reaching the people where it should reach. The programs for secular values, in the arena of culture, street theatre, songs, films, though have taken off well, remain nascent. We have a long way to go for national unity, which is very much needed at the present time. The act of nation building is to follow the path of Liberty, Equality and Fraternity. This whole exercise of Babri demolition has been the one of attempts to break the national unity, in a serious way. To put salt to the wound the communal forces are getting more legitimacy, one hopes that the lessons of Babri demolition are taken seriously by the society and state to reverse the trends initiated by this ghastly tragedy.